Arianespace's third launch of the year took place on Thursday, April 5, 2018 at 6:34 p.m. (local time) from the Guiana Space Center (CSG), Europe's Spaceport in French Guiana. 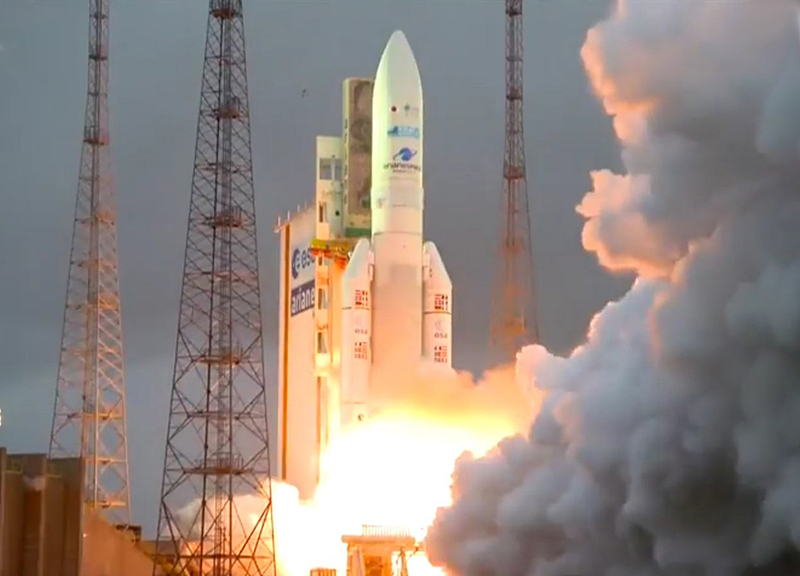 With this latest successful launch, Arianespace confirms its status as a benchmark launch services provider for the country's two leading operators, SKY Perfect JSAT and B-SAT. At the forefront of Ka-band satellite communications in Europe, Africa and the Middle East, Avanti Communications' HYLAS satellite fleet provides broadband Internet access via top service providers to homess, schools, Mobile Network Operators (MNOs) and governments. Thanks to its Ka-band capacity, HYLAS 4 will provide secure and reliable satellite communications services to Internet Service Providers (ISP), Mobile Network Operators (MNO's), governments and satellite operators throughout Europe. This High Throughput satellite will also cover regions in central and western Africa, while its steerable spotbeams will enable it to cover Europe, the Caribbean, the Middle East and South America. With today's Flight VA242 mission, the 98th completed by Ariane 5 since it entered service in 1996, Arianespace has now launched its 200th and 201st satellites with its heavy-lift launcher. This is a record for the Ariane launcher family, since the previous generation of Ariane 4 vehicles had orbited a total of 187 satellites during its entire service life. The 201 satellites were launched for 70 different customers, amounting to a cumulative total mass more than 775 metric tons. "Arianespace is very proud to serve our Japanese and British customers with this third launch of 2018. We are very honored by SKY Perfect JSAT's ongoing trust in us, since we have launched 19 of their satellites since 1989; and by the trust of the Japanese Ministry of Defense. Congratulations go to Avanti Communications, which has entrusted us with the launch of all three of its satellites now in orbit. I would like to congratulate NEC Corporation and Mitsubishi Electric Corporation, builders of DSN-1/Superbird-8, and Orbital ATK, which built HYLAS 4. "I would also like to thank all of our partners in this new Ariane 5 success which confirms the launcher's outstanding reliability: ArianeGroup, together with the entire industrial sector; ESA, which provides key support for the Ariane program; CNES/CSG, our ground segment companies and all staff at the launch center, who are mobilized with us for a sustained launch rate. And finally, "bravo" to everyone at Arianespace who successfully completed this third launch of the year." Arianespace uses space to make life better on Earth by providing launch services for all types of satellites into all orbits. It has orbited more than 570 satellites since 1980, using its family of three launchers, Ariane, Soyuz and Vega, from launch sites in French Guiana (South America) and Baikonur, Kazakhstan. Arianespace is headquartered in Evry, near Paris, and has a technical facility at the Guiana Space Center, Europe's Spaceport in French Guiana, plus local offices in Washington, D.C., Tokyo and Singapore. Arianespace is a subsidiary of ArianeGroup, which holds 74% of its share capital, with the balance held by 17 other shareholders from the European launcher industry.